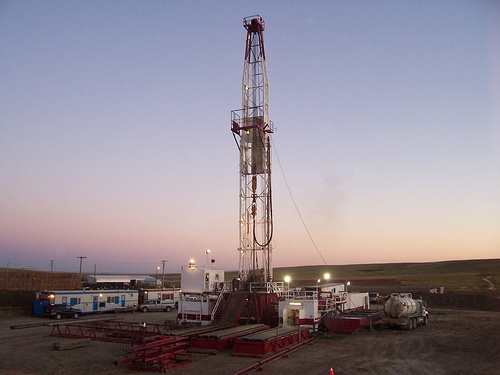 Without sensible oversight in Converse County, where this project’s 5,000 wells would be drilled, Wyoming taxpayers will be left with more pollution and millions of dollars in wasted natural gas. In fact, a new report [PDF] from the Wyoming Outdoor Council estimates venting, flaring, and leaks of natural gas already cost Wyoming up to $96 million in wasted natural gas every year. And this means Wyoming taxpayers are missing out on as much as $16 million in lost revenue every year. Capturing more of that wasted gas could help Wyoming communities fund education and infrastructure, as well as create jobs in efficient energy production. This waste problem will only get worse if these 5,000 new Converse County wells are drilled without sensible waste reduction measures in place. Something similar happened in Pinedale. Rapid oil and gas development at times put it on par with smoggy Los Angeles in terms of ozone levels. Fortunately, the state of Wyoming stepped in to address the issue by requiring that well operators check facilities for leaks that cause high smog levels. Unfortunately, those state standards don’t apply to the proposed project in eastern Wyoming. That means if BLM continues to try and dismantle its methane waste prevention rule, and the state of Wyoming doesn’t intervene to implement similar statewide controls, the communities of Converse County will be left with dirtier air and millions of dollars less in royalties meant for their schools and roads. There are additional missed opportunities for economic gains to be had from greater sage-grouse conservation. The outdoor recreation and tourism industries benefit from roughly $1 billion a year in economic output driven by sage-grouse. Wyoming will lose out on these economic opportunities if essential protections – like the State of Wyoming’s Greater Sage-grouse Core Area Strategy – are not carefully implemented. While BLM is dragging its feet on implementing conservation plans for the bird, the landscape is being developed in a way that could have long-term consequences for the sage-grouse and the 360 other species of concern that share this landscape. Wyoming Governor Matt Mead has been a long-term leader on protecting Wyoming’s air quality and working landscapes. The people of Wyoming, therefore, should not be left holding the bag for Interior Secretary Ryan Zinke’s negligence in cutting wasted taxpayer resources and protecting our imperiled wildlife. Jon Goldstein is EDF’s director of regulatory and legislative affairs for oil and gas. He is based in Colorado. Sara Brodnax is EDF’s senior manager of habitat markets. She is based in Wyoming. This entry was posted in Climate Resilience, ecosystems, Wildlife Protection and tagged air quality, BLM, BLM methane rule, Converse County, greater sage-grouse, Interior, Matt Mead, methane, natural gas, oil and gas, Pinedale, public health, report, secretary zinke, wildlife, Wyoming. Bookmark the permalink. Both comments and trackbacks are currently closed. I work at a gas plant and we do everything to provent gas leaks. We have the LDAR program that makes it mandatory that any and all gas leaks be repaired with in 5 days. Other leaks are tagged for repairs to be made asap. In the meantime, those continuous leaks cost that company millions. Any and all vented gas is tracked and reported, and fines are involved. All gas companies are are required to report and venting and spills. Avian protect is taken very serious. All these said gas companies support BLM, environmental health, as well as animal conservation. Ever ask yourself about what these gas companies supply? It is not just natual gas to warm your homes, but many fossil fuels are used to make many things needed in the day to day needs and desires. Without fossil fuels where would that leave us?